The Memorial Day Weekend has multiple significances for me. 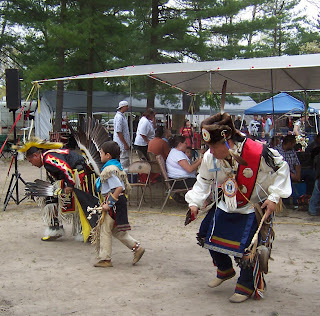 It is a time to remember and reflect, a time to honor the fallen warriors who have died in service of their nation, and it is the opening of the outdoor powwow season in Michigan. Pow wows are Native American gatherings, but they are open to all. If you've never been to one, you should consider going! There is drumming, dancing, laughter and food, crafters and vendors, and always there is an honoring of the people who make our lives possible and those who enrich it. Warriors, women, children and elders, healers and storytellers; all are celebrated in their own fashion. Doing it all under a clear blue sky makes for a near-perfect event! It officially begins with Grand Entry, when the veterans carry in the Eagle Staffs and the Flags, followed by dancers in their beautiful regalia. 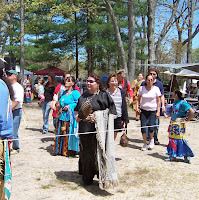 There are honor dances, which are never photographed, exhibition dances like the Sneak-Up, and intertribal dances where everyone can participate! Friends gather; some insist you pose for a photo of yourself in your stand. 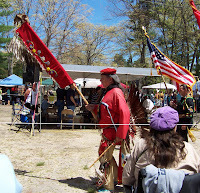 It's only right, you're told, that if you're going to blog about the powwow, you should be included. We camp, we tell stories or drum around the campfires, we gather as a community and do all of the things that implies. I had a great time, and next month I get to do it all again! You can check the left sidebar for dates of powwows I'll be attending; I'll update the list as my schedule firms up. To find a powwow in your area, I recommend the Powwow Calendar at http://www.powwows.com/ for some excellent information on events throughout North America. 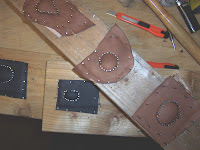 In the three and a half decades that I've been crafting leather there have been times when people have questioned whether or not I actually produce my product. Generally this has come in the form of a backwards compliment -- the person raising the issue is impressed enough with what they see that they express incredulity that a little-ole-gal like myself could be solely responsible. I take those skeptics with a grain of salt; they mean well. 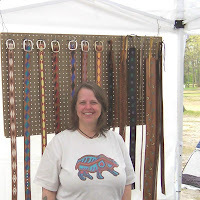 Occasionally it's in the form of sexism -- at craft shows I sometimes am faced with the question of whether or not "the guy that does this" takes custom orders... those people are a bit more difficult to be gracious with, I confess, as my feminist hackles can get riled by such queries. But again, I try to be nice, if a bit defensive. There is no "guy", and I usually try to laugh while I say that. Today I had something entirely unprecedented happen to me. I received an email from the staff of one of my primary venues raising the issue of whether my goods were handmade by me, or if I was reselling products I purchased, which would violate that venue's rules. After picking myself up off the floor I responded quite vigorously. Of course I make my own stuff!! It's a mistake, to be sure, and I'm confident that I'll get it sorted out. But in the meantime my defensive instincts kicked into hyperdrive and my gut was left churning. 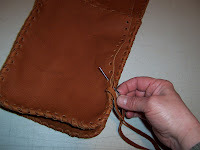 I wondered how I could prove my case, if required to, and I thought about all the posts I've blogged with pictures of my workspace and my hands on the leather. I pulled all the pictures and looked at them, and I gave myself a very good laugh in the process!! 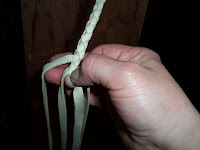 I have no pics of my hands on the work -- just my hand. My right hand, to be specific. That's because my left hand is holding the camera. So Hah!! That's how do-it-yourself this little-ole-gal is!! 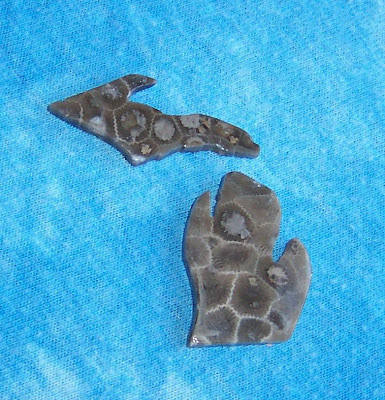 During the Devonian period Michigan was very different than it is now. It lay geographically near the equator and was covered by a warm shallow sea, which was home to large coral reefs. 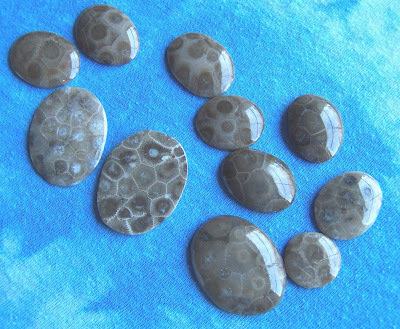 Fragments of those reefs live on in the Petoskey Stone, which can be found only in Michigan. In its natural form it is plain and gray; indistinguishable from limestone rocks. But wet it with water or polish it, and the distinctive segments of coral fossil spring into view! 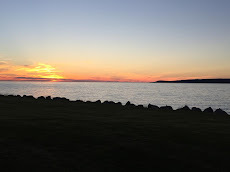 The word Petoskey is derived from the Odawa word Pah-toh-se-geh, which means "rising sun" or "rays of dawn". 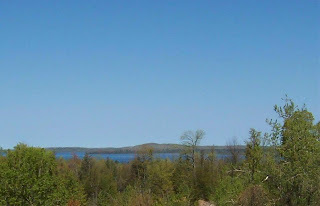 It was the name of a renowned chief of the Odawa Nation, and there is some dispute as to whether the stone was named for him or for the actual meaning of the word. 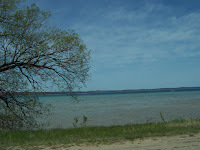 It was officially named the State Stone of Michigan in 1965; the first fossil ever so designated. Ancient wisdom notwithstanding, patience has never come easily to me. Strange, then, that I should fall in love with a craft that requires so very many waiting periods! 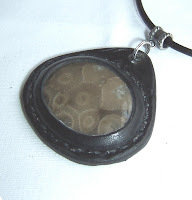 I recently finished a batch of my original stone and leather pendants that I call Earth Medallions. 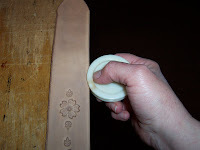 It's an arduous process that is, thankfully, very satisfying in the end. 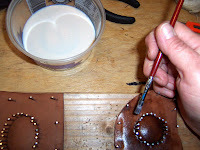 There are more than twelve different steps involved in making them, and each step has a drying period involved! Most of the steps I won't be showing you -- it took me awhile to develop this process and I'm not ready to reveal all of the secrets just yet. By the time they get to the tacked stage, they've gone through five do & wait procedures. After tacking they have to wait for 12 - 15 hours to dry completely. 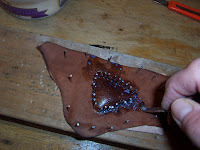 Then I apply my special formula that protects the leather and helps it hold its shape , wait for that to dry, then there are another several do's followed by another several waits. It takes days to get to the point where they are formed, edged and revealed. This is the most agonizing of the waits. I can see how nice they look, but the edge sealant has to dry for another several hours before finally! they can be attached to their floating bales and strung. At last they are done and ready to find their homes! I've had a very good response to these -- the ones I'm showing you finished here have already sold. To see the rest of this batch you are welcome to visit my shop at Etsy.com -- the link is on the left at the top! I'd like to also mention my favorite bead store, Nawbin in Traverse City, Michigan -- they were the source for many of these special stones! 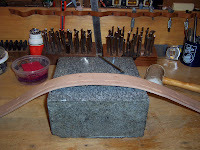 The impending demands of the summer tourist season require long hours in the workshop. The world outside wakes up, I shake off the low-light blues and want to go out and play!! Work wins. Usually. But look at the temptation I have to resist!